This is based on middle eastern food, the split pea stew being something traditionally found in Persian cookery. The source of this idea was the peerless Claudia Roden, specifically her book Middle Eastern Cookery. 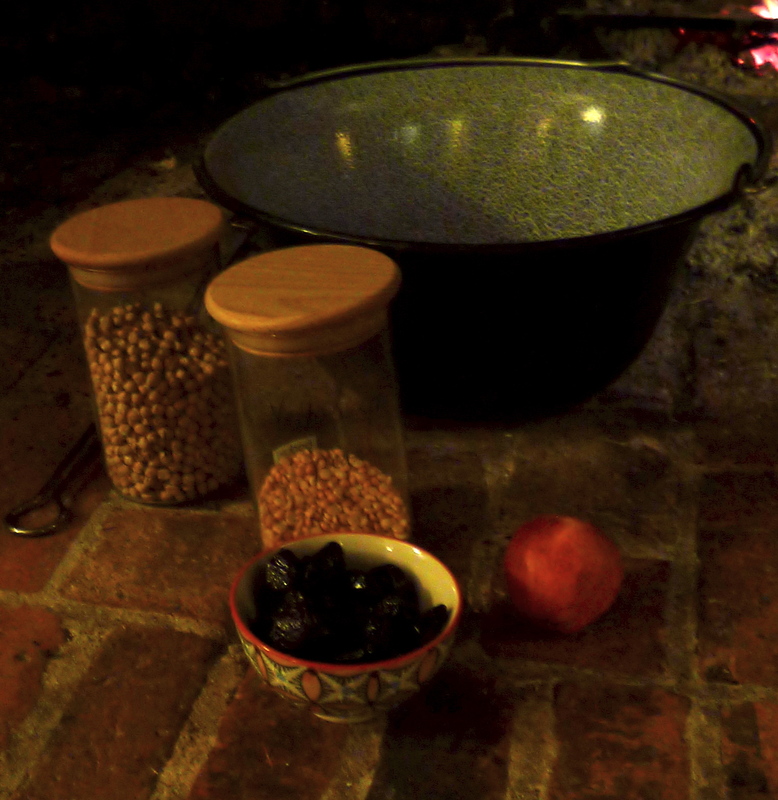 This is probably the most popular slow-cook main course that we cook on the fire (click here). 3 tbsp melted butter / cooking oil – you can get away with less if you are cooking this is a normal pan on the hob, as you have more controllable heat and less risk of catching. 1lb / 500g dried apricots. I’ve used stoned prunes, and 50:50 stoned prunes:apricots; they’re all good. When the pan is hot, pour in the fat, and tip in the meat. Brown it all over. You may need to do this in batches, but with a hot dutch oven / kotlich pan, you should be able to do it in one go, without it stewing. When the meat is lightly browned all over, add the split peas, and pour over just enough water to cover. Season with salt and pepper. Bring this to the boil – this can take a while over the fire. There will probably be some scum forming at this point, so skim it off. Then cover the pan, and simmer until the meat is tender. This could easily take about 2 hours. Keep an eye on the liquid level, and stir from time to time, to make sure that it doesn’t boil dry, or catch on the bottom. Add all the fruit, and the cooked chickpeas, and cook for a further ½ hour. Traditionally you would serve this with rice, but rice is frankly a handful on the open fire, so we simply warm some flatbreads to eat with it. You can play with the flavours, adding lemon juice when you add the fruit if you find this too sweet, or adding honey at this stage if sweet is the way you like it. We often add some zucchini / courgette, in very big chunks or it will simply disappear, at the fruit adding stage.